A buck stands on the hills of Fort Thomas off of Route 8, looking over the Ohio River. FTM file. The number of deer-related vehicle accidents went down by one from 2015 to last year, but since allowing hunters into the city to help cull the herds, not much progress has been made to reduce vehicle accidents according to a report produced by the city. Fort Thomas began crafting ordinances to deal with the increasing deer population in 2007. Most recently in October of 2013, council amended the ordinance to allow the discharge of arrows from a half-hour before sunrise to 10:00 a.m. and to allow owners of contiguous lots cumulatively three acres in size to combine their lots to allow hunters onto those properties. Lots in red are eligible for hunting deer in Fort Thomas. Click image to see in larger window. In 2016, there were seven crashes on Route 8, followed by six on Memorial Parkway. Since 2003, deer-related vehicle accidents on those two roads have accounted for 47% of all crashes. Previously Vision Air Research was contracted by the city to fly over Fort Thomas and take an infrared "deer census" in 2010 and counted 205 deer. In 2012 they counted 132 deer. In February 2013, Vision Air Research was once again paid by the city and this time counted 96 deer, which equates to around 15 deer per square mile, according to city reports. Council paused this program that year. 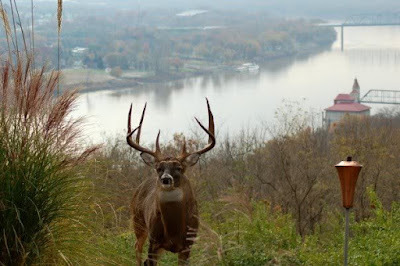 According to the report prepared by the city that year, city staff conducted “internet research” that showed maximum deer density can be up to 20 deer per square mile.The city then also consulted with the Kentucky Department of Fish and Wildlife who has indicated the preferred density for deer is up to 15 per square mile. That trend, with data provided by Vision Air Research, would indicate a thinning of the deer herd, a success in the Fort Thomas Archery Program, however the increase in deer-related vehicle crashes tells a different story of the program's success. Since allowing for the discharge of arrows permitted in December of 2011, city crash data would indicate that the number of crashes are on the increase, topping out at 27 crashes in 2013 and settling at 22 crashes last year. This also represents a 69% increase from the lowest level of deer-related vehicle crashes in 2010 to last year. (7) When the discharge occurs on a lot 3 acres or greater in area, or on a combination of contiguous lots under the same ownership which cumulatively are 3 acres or greater in area. (B) The provisions of this subchapter shall not apply to any individual discharging an arrow as part of an educational program on property owned or controlled by the educational institution, specifically including, but not limited to, archery classes taught in a public or private school. I curious as to what constitutes a crash? Is is only hitting a deer, damage to a vehicle or injuries by one or both parties? Also, clearly the deer are much more active during mating season. Why do we not have ACTIVE signs on Memorial Pkwy. Like Ohio had? Just wondering. I drive very, very carefully during mating season. I successfully avoided colliding with a 6 point buck on Memorial Pkwy by watching the side of the road constantly, brights on when able, and not driving fast. I agree with both commentors. Being proactive can save the deer's life and perhaps your own, let alone your car. They're easy to spot if you drive slowly enough and are usually grazing on the side of the road. Even the deer I've seen IN the streets are walking slowly - which one could easily avoid if driving slowly. They rarely bolt on the city streets. And why not have signs for the people who are not aware of mating season (are there any?) or at least for those travelers who are not familiar with our streets that have heavy deer populations.